Cookistry: Need fresh buns for dinner? Do the work the day before! Need fresh buns for dinner? Do the work the day before! I needed to bring some buns to a dinner I was going to, and I knew the day of the dinner was going to be a busy one. I wanted to bring freshly-baked buns. What to do? 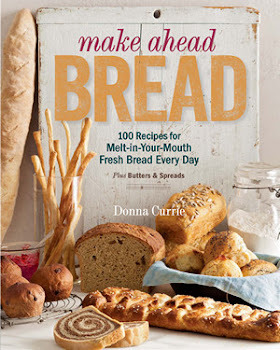 This is a perfect example of what my upcoming book, Make Ahead Bread, is all about. The recipes let you do most of the work the day before, and finish the process on the day you want the bread. It makes a lot more sense than getting up at the crack of dawn to bake bread for dinner, or juggling oven space and temperatures to get everything done on time. This recipe isn't in the book, but it's the same concept. As usual for me, I did all the mixing in my stand mixer, but you can certainly knead by hand. If you do choose to knead by hand, use softened butter. If you're using a stand mixer, you can add cold butter; the mixer will have no trouble incorporating it. I used Red Star Platinum yeast here, but you can use active dry or instant - whatever you have on hand should work just fine. If you're using an active dry yeast other than Red Star, let it soften a bit in the water while you gather the rest of your ingredients. Put all the ingredients except the butter in the bowl of your stand mixer fitted with the dough hook. Knead until the dough is elastic. Add the butter and continue kneading until the butter is completely incorporated. Cover the bowl with plastic wrap and set aside until doubled in size, about 1 hour. Flour your work surface and spray a 9x13 baking pan with baking spray . Refrigerate the buns overnight or up to 24 hours. When you're ready to bake, remove the pan from the refrigerator and preheat the oven to 325 degrees - I like to let the oven heat for 30 minutes and let the buns sit at room temperature for that same amount of time. Uncover the buns and bake at 325 degrees until they're nicely browned, about 30 minutes. Remove the buns from the pan (they should flip out easily) as soon as you can and let them cool completely on a rack. Note: If you like, you can brush these with an eggwash (1 egg, beaten with 1 tablespoon water) before baking for a shiny crust. If you eggwash, you can also sprinkle the tops with sesame seeds or other toppings - the eggwash will help the toppings stick to the tops of the buns. It's salad month! Let's make some ranch dressing! Gadgets: Pot Clips - No, not that kind!